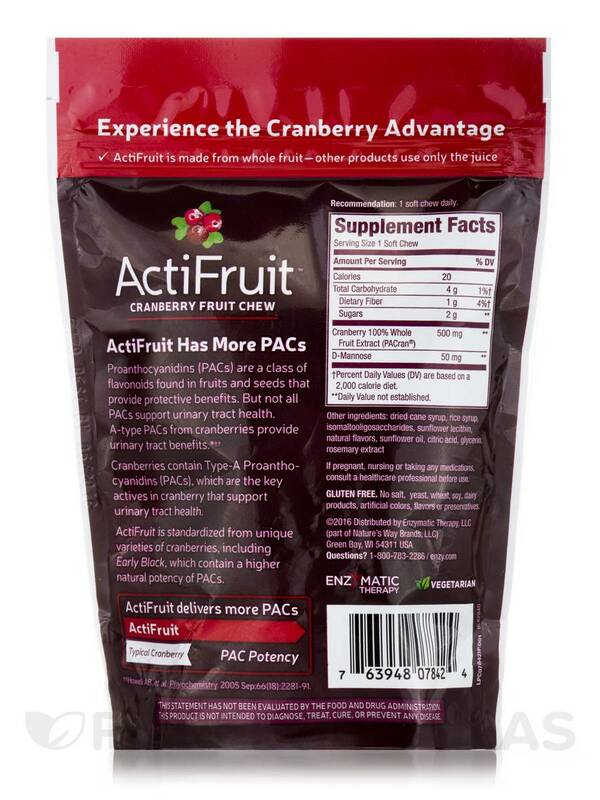 My minor son has to take ActiFruit™ Cranberry Fruit Chew by Enzymatic Therapy daily due to having a sensitive bladder. These work for him. ActiFruit by Enzymatic Therapy are excellent and make all the difference! Anyone that has bladder or urinary problems this is something good to have on hand! Will reorder. Read about this in a book by a doctor. 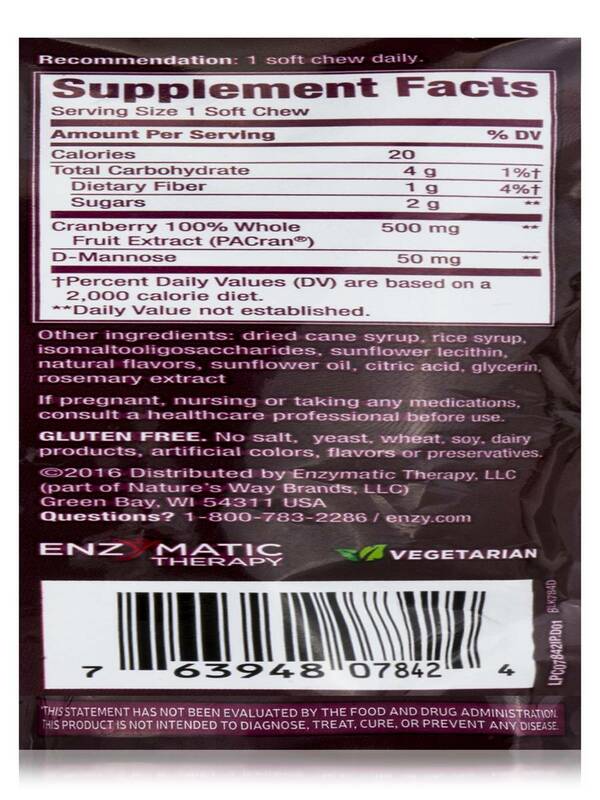 ActiFruit Cranberry Fruit Chews by Enzymatic Therapy are high-quality cran chews. They are flavorful, preserving the slight tartness of actual cranberry fruit because the product contains actual fruit rather than only dry cranberry powder. ActiFruit from Enzymatic Therapy is a dietary aid‚ provided in soft chewable capsules‚ which may possibly promote a healthy bladder. 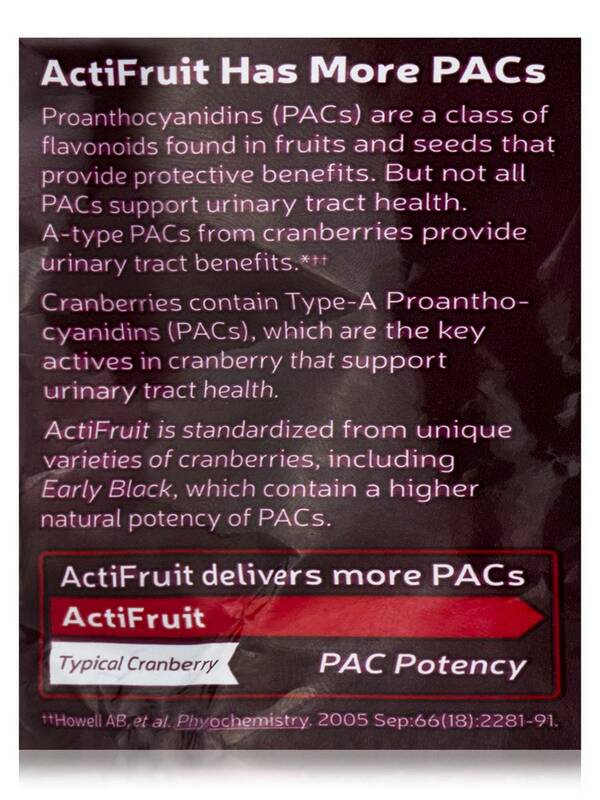 This Enzymatic Therapy supplement contains cranberry fruit that contains D-mannose—a nutrient that may possibly help prevent the occurrence of urinary tract infections. Cranberry fruit also has a high nutrient content and acts as an antioxidant. The potential benefits of this fruit include possibly improving the immune system and some cardiovascular functions. Cranberry fruit contains vitamins C and W. Vitamin C may possibly help improve the body’s resistance to infection and vitamin E is believed to help support the immune system function. Other Ingredients: Dried cane syrup‚ rice syrup‚ isomaltooligosaccharides‚ sunflower lecithin‚ natural flavors‚ sunflower oil‚ citric acid‚ glycerin‚ rosemary extract. Gluten-Free / Salt-Free / Yeast-Free / Wheat-Free / Soy-Free / Dairy-Free / Artificial Colors‚ Flavors or Preservatives. I like how they are chewable. As usual my order came fast. ActiFruit by Enzymatic Therapy is just what I needed. Too early to know if it works but I'm sure it will. Easy to take and best price! Cranberry Supplements- A go to product! Easy to chew and tastes good. This price was unbelievable and beat everyone! My mother takes these to prevent UTIs. Thank God they work because antibiotics make her very sick. They are a little sticky on the teeth. I have personally used these soft chews since year 2000. At the time I was going on an extended trip no days left to get to urologist quick to local pharmacy to read every cranberry supplement label found these &quot;chews&quot; which had low sugar and carbohydrates. (Important to some of us to avoid diabetes!) Hooray for a good choice that eliminated urinary tract problems every day since then. Hubby now uses 1 daily also. His problems went away also. 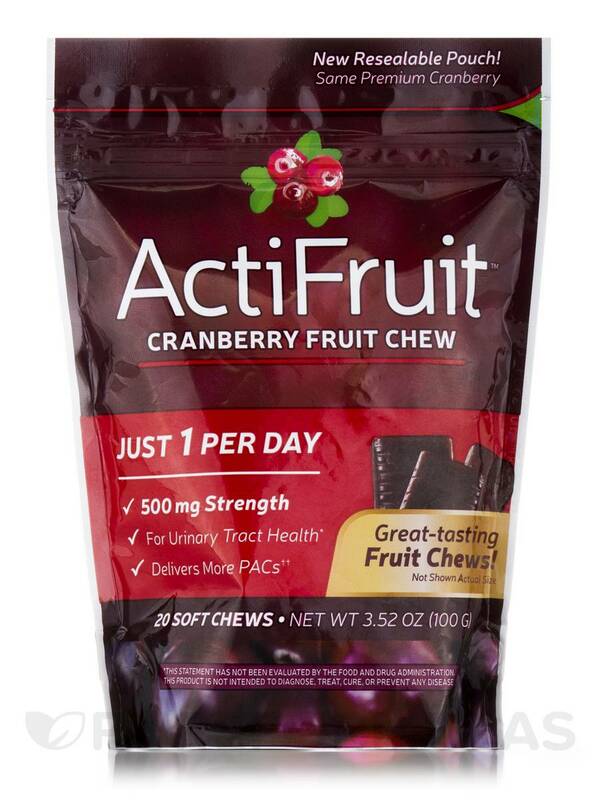 ActiFruit Cranberry Soft Chews work!! Found on-line shopping to be the most economical.